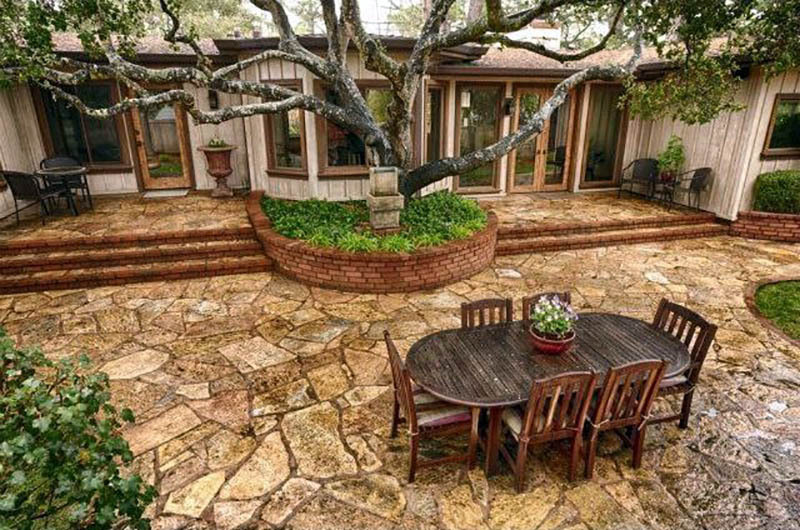 Welcome to our gallery of best flagstone patio designs. A flagstone patio is a great way to take advantage of a yard, whether it may be for personal relaxation or for bonding with family or friends. Flagstone patios add a stunning visual element to outdoor spaces. The unique pattern and texture of natural flagstones give off a distinct character, making patios more inviting, welcoming and aesthetically appealing. Below we explore different flagstone patio designs to help you decide which one is the best for your home. The versatility of beige sandstone makes it a popular choice for stone patios which are both traditional and modern inspired. 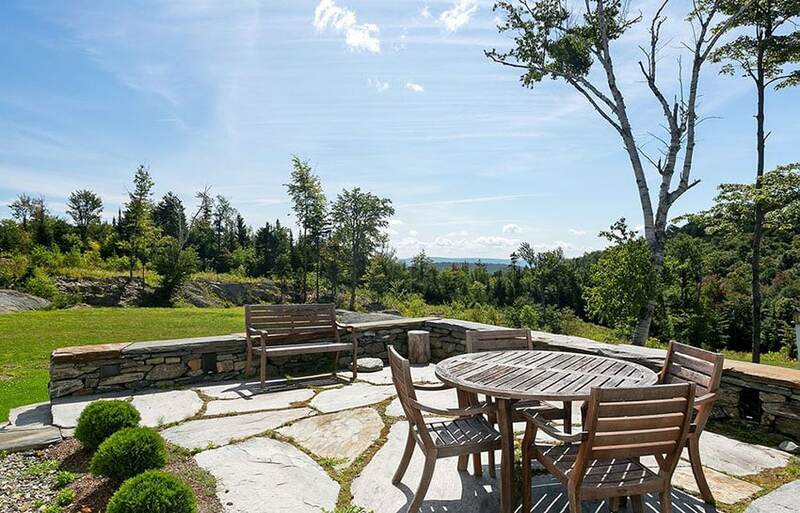 The flagstone patio pictured above harmoniously blends with the deco stones of the exterior walls and built in seating of this cozy contemporary home. What is a Flagstone Patio? 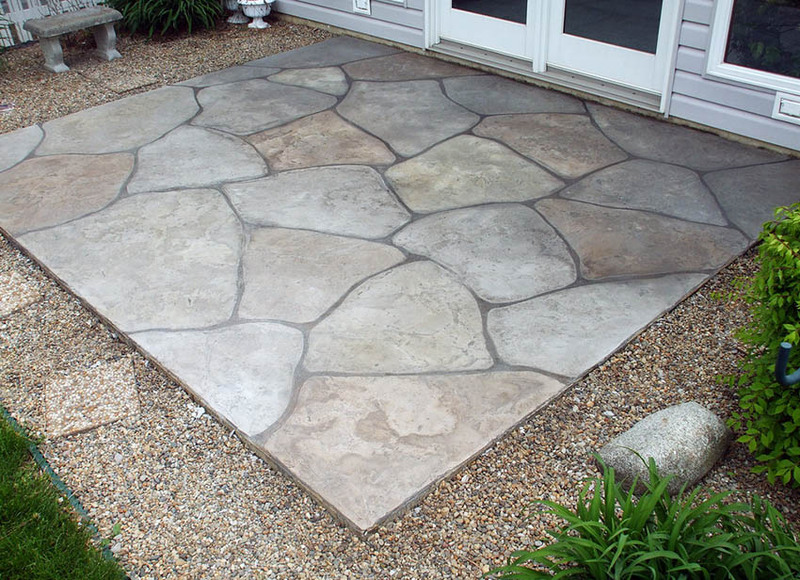 A flagstone patio is consisted of various pieces of stone laid as “flags” in a particular pattern. By definition, a flagstone is a general term for any “generic flat stone which is normally used for paving slabs or walkways and other outdoor areas”. It may be a sedimentary, metamorphic or igneous rock which is consisted of layers of sand, clay,organic sediments and other minerals. Flagstones are commonly used for patios, fences, pathways, fire pits, pool areas, walls and even roofing. Adds visual appeal to your home. Flagstones have a natural look and a unique aesthetic charm which makes it an interesting paving material for outdoor spaces. Boosts the value of your home. 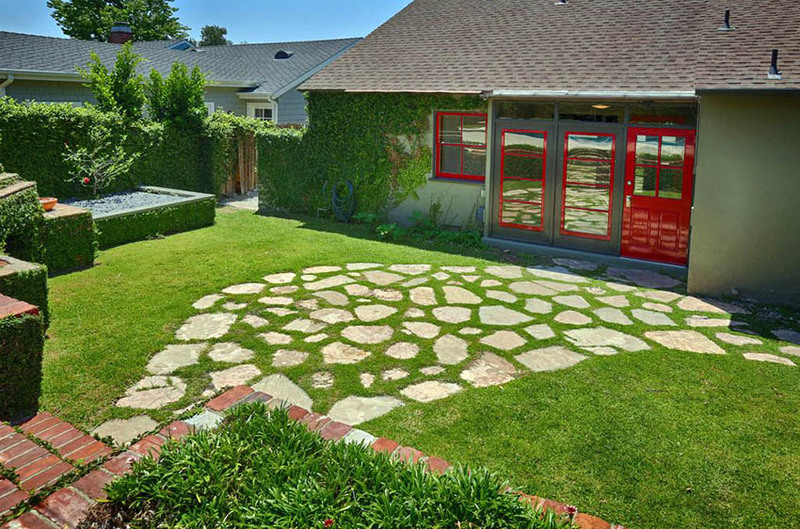 A striking flagstone patio increases the value of your home and makes it more appealing to buyers in case of resale. Flagstone offers versatility in terms of design. Flagstones are available in a wide range of options of colors and sizes. It is suitable for both traditional and modern inspired houses. Flexibility in application. Flagstones can be used as paving materials for any type of outdoor space, whether it may be a low or high traffic area. Flagstone is highly durable. 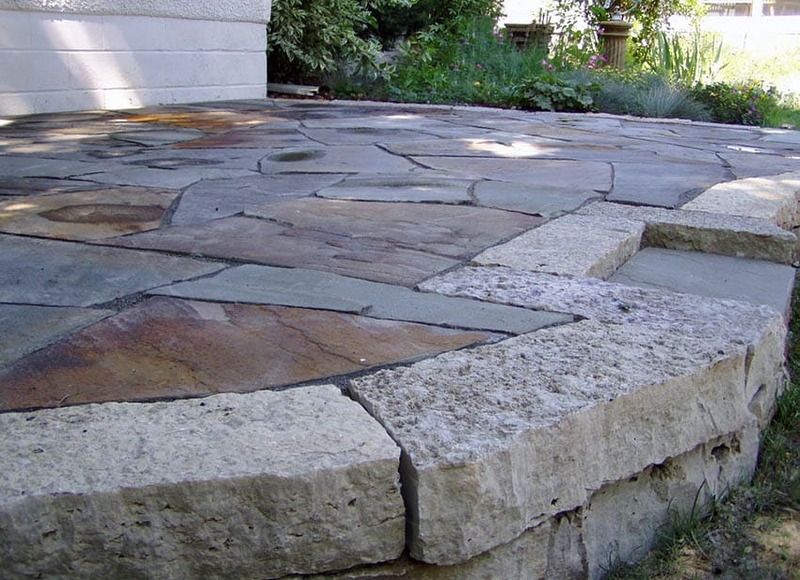 Compared to other materials like concrete or pea gravel, flagstone is way ahead in terms of stability and durability. It is known for being resilient and resistant to cracking and chipping. In addition to that, it can handle the weight of additional load like outdoor furniture. Low maintenance. Flagstone requires little to no maintenance when installed correctly. Sweeping and adequate hosing down of water is all you need to keep it clean. Offers a non slip surface. Unlike other materials such as outdoor tiles, flagstone is a perfect material for pool sides, patios and walkways. It is not slippery when wet because of its rough texture. Resistant to moss damage and acidic soil. Flagstone is weather resistant. It can withstand harsh outdoor elements, extremely hot weather and cold winters without corroding. Flagstone is an easy material to work with. Flagstone is guaranteed to last for decades. Flagstone is porous. Flagstones are natural stones which make them inherently porous. Flagstones such as sandstone is porous and quite absorbent and may require treating before use. Flagstone patio designs sometime have uneven surfaces due to their varying size and thicknesses. This can be avoided with proper installation. Might require additional assistance in installation. Although the process of installing a flagstone patio is relatively easy, handling the material can be quite a challenge due to its size and weight. Flagstone patio designs make stunning focal points even for small outdoor spaces. The light earthy color of travertine flagstones make this space appear bigger. Flagstones are available in different types, sizes, shape and thicknesses. It comes in a broad spectrum of colors, ranging from soft beige hues to rich dark colors like brown, blue or gray. Here are some of the most common flagstone materials along with their descriptions and positive and negative features. Limestone – This is a type of sedimentary rock which is mainly composed of calcite or calcium carbonate. It is as dense as marble and is very durable and hard wearing. Limestone is characterized by its lightly textured surface and naturally rift appearance which is sometimes polished. Its most popular color is beige with a tinge of brown but it is available in wide myriad of colors like gray, yellow and black. Limestone is known for its insulating properties and weather resistant features. It is highly suitable for patios in humid climates as it doesn’t get too hot during summers and won’t get cold for winter. Its drawbacks includes susceptibility to damage when exposed to acid. Travertine – Well loved for its luxurious appeal, this type of natural stone is a compacted variety of limestone. Known to be temperature resistant, it can endure both hot and cold weathers. This makes it highly suitable as a paving material for patios and pool areas. It has a weathered appearance that is characterized by pitted holes. Travertine is available in shades of tan, brown and bluish gray tones. It is considered to be very durable but it has some downsides to it. Travertine is porous and can be hard to maintain because of the numerous holes in its surface. Since it is a type of limestone, it is also sensitive to acid stains and will break down when exposed to it. Sandstone – Sandstone is a warm medium toned sedimentary rock consisted of quartz and sand. It comes in a variety of earthy colors, ranging from soft pastels like beige and pink to darker tones like brown, dark red and yellow gold. Sandstone has a very natural appearance which makes it highly preferred for contemporary applications. The thicker variety of sandstone is weather resistant. Its advantages also include the ability to retain cool surface temperature even during hot weathers. Some of its drawbacks include water absorption due to porosity and added maintenance such as sealing to avoid stains. Slate – Slate is a type of fine grained metamorphic rock that is layered with clay minerals and volcanic ash. Characterized by its flaky appearance, this antique looking stone is a popular choice for traditional country inspired patios. Slate comes in a variety of colors such as gray, green with tinges of copper and rust. This type of stone is one of the strongest natural stone flooring materials as it is inherently resistant to chipping, cracking, breaking and scratches. Compared to other materials, slate is more expensive and considered to be a high end flagstone material. Its disadvantages include limited availability in large sizes and additional upkeep to maintain its appearance. Basalt – Basalt is a type of volcanic rock that has a lightly textured appearance and a natural grayish, black and beige color. Basalt has natural pits in its surface which may require additional cleaning. It is commonly used as a flooring material for outdoor spaces like patios because of its great insulation properties. Its negative features include porosity and the tendency to become dull looking. Quartzite – Quartzite is a type of granular metamorphic rock that is composed of quartz. It is compact, hard and durable. Characterized by a smooth glassy appearance, it is available in different color variants such as grays, green, blue, light tan, rust, gold and silver. Quartzite has a timeless look which makes it a perfect flagstone for classic inspired patios. It is weather proof, long lasting, can withstand wear and tear and won’t corrode even when exposed to harsh chemicals. Compared to sandstone, quartzite is more resistant to stains. However, it is likely to etch and requires additional maintenance to prevent dirt from getting stuck in its coarse textured surface. Since quartzite is also very hard, cutting it into shapes may also be a challenge. Bluestone – Bluestone is a type of sandstone which generally has a grayish blue color and a very flat appearance with a rough texture. There are also other variations which are rust, tan, brown, gray, purple or blue in color. 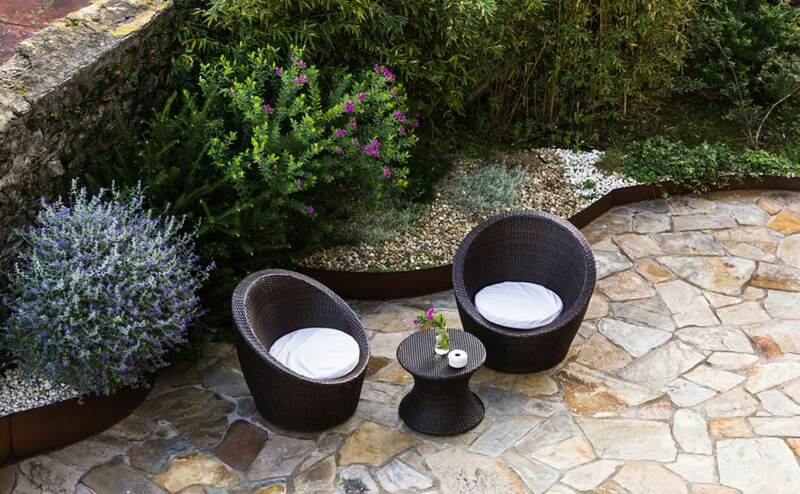 Its classic appearance makes it a graceful addition to patios and outdoor living spaces. Bluestone is very dense and considered to be a tough paving material as it can stand up to harsh winters and extreme summers. However, it has several disadvantages. It needs to be sealed to protect it from scratches, resist stains from chlorine or salt water and to preserve its color. Prized for its exquisite beauty, bluestone is also considered as an upscale flagstone material. This Mediterranean inspired patio has red flagstones which stand in start contrast with the surrounding garden of hydrangeas. To balance the look of this space, metal chairs with rust colored cushions that perfectly matched the warm color of the natural stones were added. DIY flagstone patios require little effort to install and can be done in as much as 2 to 3 days. 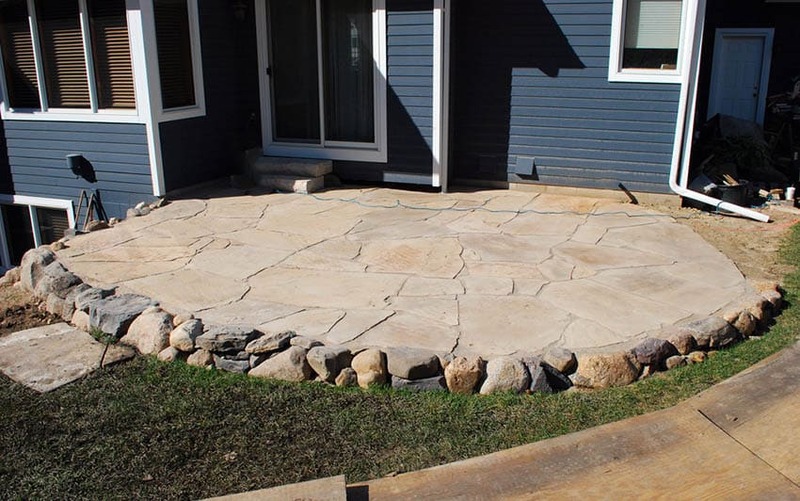 Aside from using natural stone for flags, there are easier ways to create a flagstone patio. One option is to use ready made tiles or precut paving blocks. Pre-cut stone makes assembling easier as the pieces are shaped to fit. Another option is to use concrete tiles which are made to look like natural stones. Texture and color is added to simulate the appearance of stones such as sandstone, slate or limestone. 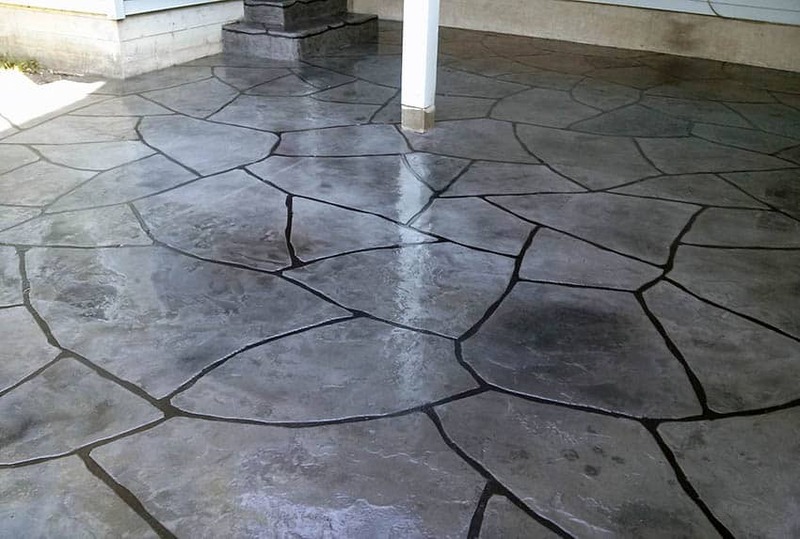 The last option, on the other hand, is to use stamped concrete. 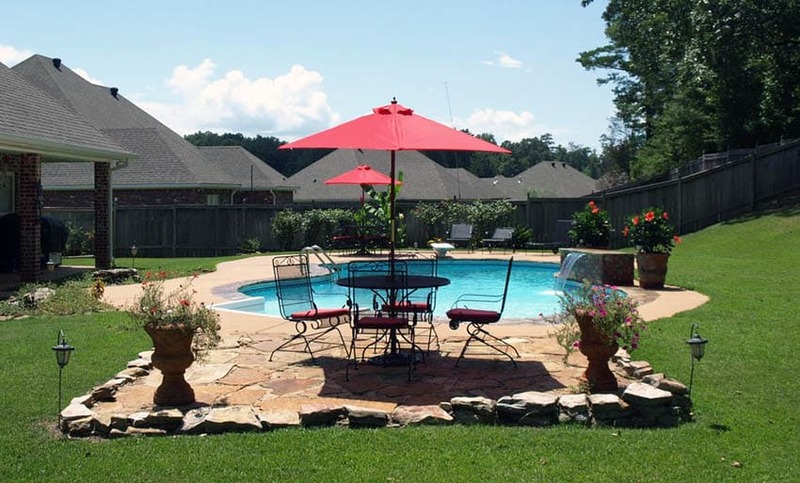 Stamped concrete is patterned concrete that is embossed and textured to resemble flagstones. This option is cheaper and cuts down 50% of project costs. The real challenge in “Do it Yourself” flagstone patios comes in setting the stone pieces in a “puzzle like” or mosaic manner. 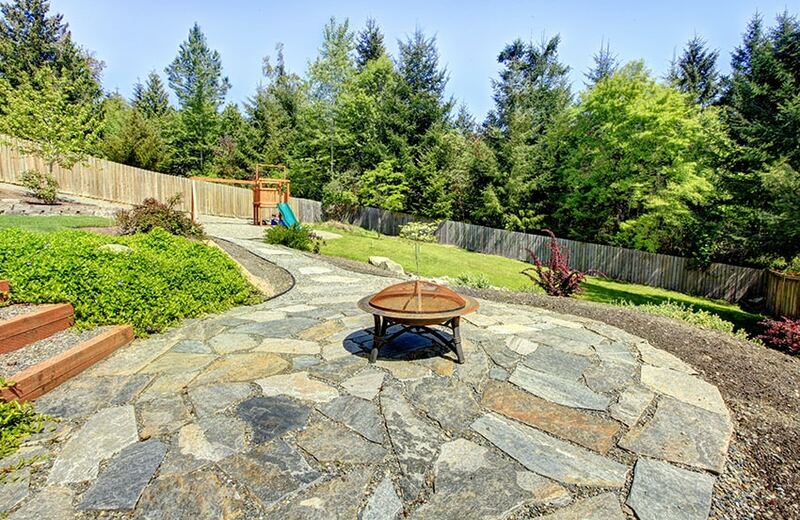 This semi circular patio has large irregularly shaped slate flagstones which add an interesting visual component to this yard. 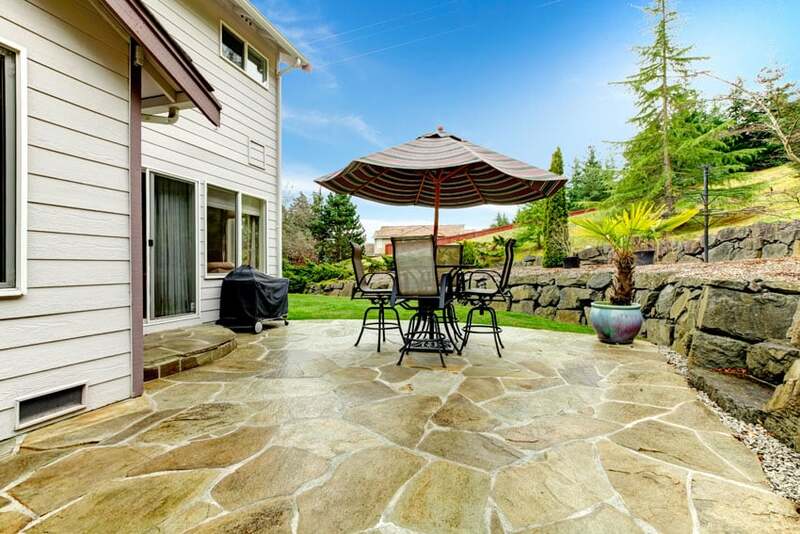 The cost of installing a flagstone patio depends on several factors namely: the type of material or stone used, the thickness of the stone, the quantity of the stone needed, the amount of square footage needed to be covered and the amount of labor. Among the types of flagstone materials discussed earlier, bluestone is considered to be at the higher end in terms of cost, while sandstone is one of the most affordable option. When it comes to thickness, thicker stones are naturally more expensive because they are more durable. This will depend greatly on the type of project you have, since high traffic areas such as patios and walkways need flagstones which are 3 inches thick. Aside from the actual stone, consumables and base materials such as sand and gravel must also be factored in the cost of the project. The location of a project may also cause a significant influence on the amount of the materials. For items which will be shipped from a far distance, an additional amount is placed on top of regular price. When it comes to labor costs, flagstones which have irregular shapes are more expensive to install because of the added effort it requires to be fit together. Matching irregular stones is like while flagstone which are custom cut in the factory are cheaper to install. Another price factor to keep in mind for installing flagstone patios is the “allowance” for the amount of materials. Flagstones are natural materials and their sizes, color and shapes are highly variable, thus a specific amount of contingency is needed to ensure that the project can accommodate these changes. Some contractors usually include a 25% allowance for the estimated materials. To give you an idea, these unforeseen circumstances are usually caused by unmatched stone or damages in handling. Also, this will ensure a sufficient supply of stones to complete the project. The total cost of installing a flagstone patio typically averages $15 to $30 per square foot. A whole flagstone patio installation project, on the other hand, usually cost $700 to $5000 per lot including professional installation charges. The actual stone itself usually typically costs $3 to $5 per square foot. You can also buy the stone in bulk or in tons if you need to cover about 80 to 200 square feet in order to save on costs. Actual stones typically cost anywhere from $150 to more than $700 per ton. It is also important to know that once your flagstone patio is installed, an additional treatment is needed to ensure the longevity of its life and the consistency of its appearance. Periodic sealing and application of stain is needed every 1 ½ years to 3 years to keep your flagstone patio well protected. This usually costs an additional $30 to $60 per quart or $100 to $200 per gallon of sealer. 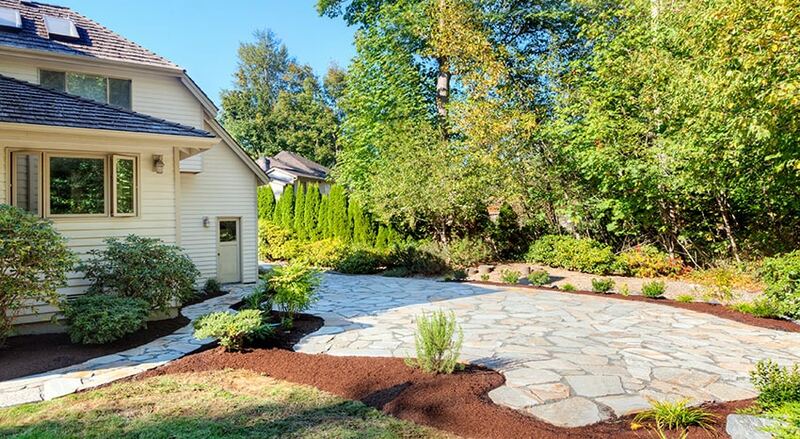 Since flagstone is considered to be expensive, some homeowners try to reduce costs by usually mixing natural stones with cheaper paving materials such as concrete, pavers or bricks. If you want to upgrade the pavement material of your patio but would want to save on labor costs, then DIY’ing it is your best bet. Laying a flagstone patio will take about 48 hours to complete. The real challenge in this project is not the process it entails but the effort to carry big heavy stones. 1. Construction Method – There are two methods of laying flagstones for pathways, walkways or patios. The first one is the “Dry Laying Technique”, otherwise known as the dry construction method, which is characterized by simply laying flagstone pieces in a bed of sand and gravel without the use of mortar and concrete. This process is DIY appropriate because it reduces time and effort as it eliminates the need to prepare cement and wait for the additional curing time to elapse. The second method , “Mortared Construction” or the wet construction, is the exact opposite of the first method, wherein pieces of flagstone are permanently set with mortar to a base of gravel, sand or concrete slab. The joints are then filled with more mortar, sand, fine gravel or grout. Wet construction is more permanent compared to dry construction but it requires additional upkeep such as regularly adding sand to joints. Dry construction is an easier method but its drawbacks include the tendency of constant readjustment and movement between the pavers. 2. Choosing your Stone – Flagstones come in different types, shapes and sizes. Each of these factors must be considered when deciding on what type of stone must be used for your project. One key tip to consider is to always choose your flagstone in relation to its intended purpose – whether it will be used in patios with furniture or a high traffic area. • Thickness – The typical thickness of flagstones is usually ¾ inches to 3 inches. Thin stones have the tendency to crack under weight making them inappropriate for high traffic areas. They are also usually installed over an existing concrete slab. Flagstones which are thicker than 2 inches are suitable for heavily used walkways and patios with an entertainment area. Although more expensive and a lot heavier, it can guarantee more stability and durability. • Stone Size – Larger and flatter stones are perfect for high traffic areas, especially if you plan on setting up an outdoor living area in your patio. Also, when bigger flagstones are used, less “puzzling” is required. Smaller and irregular flagstones are better for small gardens . • Spacing and Layout – If aiming for a more formal look, use flagstones which are more consistent and similar in shape. No flagstone is exactly alike because each individual piece has a different shape, so you can only choose a close match but not a perfect match. Irregular flagstones, on the other hand, evoke informality. Also, you can use smaller gaps in between flagstones if you plan on putting outdoor furniture in your patio because it is more compatible for the legs of a table or a chair. Closer flagstones also have a clean look. If you want to put ground cover in between the flagstones, you may opt to use more adequate amount of gaps. • Type of Joints – There are 2 types of joints for flagstone pavers, the random joint and the consistent joint. 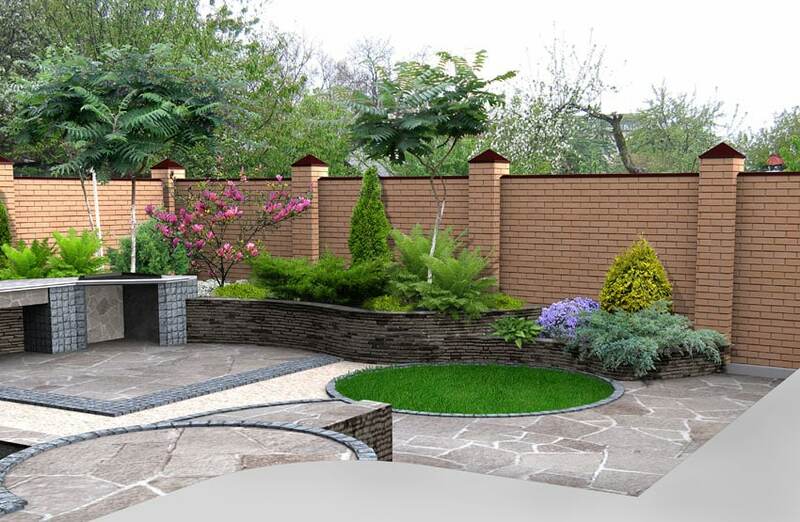 Random joints make use of the natural edges of the stone, this usually create 1/2 to 3 inches spacing and are ideal if aiming to achieve a rugged look. Consistent joints, on the other hand, are shaped edges which usually create a ½ inch to ¾ inches spacing. An angle grinder is used to achieve a desired shape. This type is more suitable for achieving a more elegant and formal look. 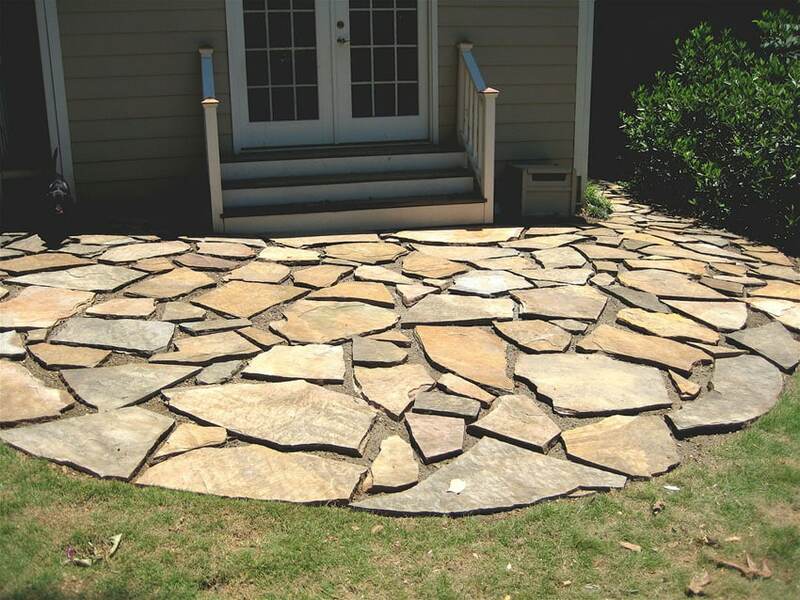 • Color of the Stone – There is no general rule in choosing the right color of flagstone for your patio. You can select according to your own taste and preference in style. Slate, for example, has a greenish gray color which makes it appropriate for contemporary patios, sandstone has soft pastel colors which give out a traditional old world feel, while quartzite has warm earthy tones which are perfect for Mediterranean inspired patios. Also, to ensure proper color matching, it is suggested that an allowance in quantity is added when buying your flagstones. It can sometimes be difficult to get the exact shade and match if ordering in different batches. • Joint Fillers – Filling material is placed in between the joints of flagstones to ensure that they are firmly kept in place and to avoid movement. Materials which can be used as fillers are grout, mortar, pea gravel, sand, compactable gravel and gator dust. Pea gravel are small pebbles or river stones, while compactable gravel is finely crushed granite. Gator dust is a mixture of polymer binders and gravel which hardens when applied. • Slope or Grading of the Patio – Always build your flagstone patio at a slight angle so it drains off when rainwater comes. You wouldn’t want a puddle stuck in the middle of it, so make sure that it is not perfectly leveled. 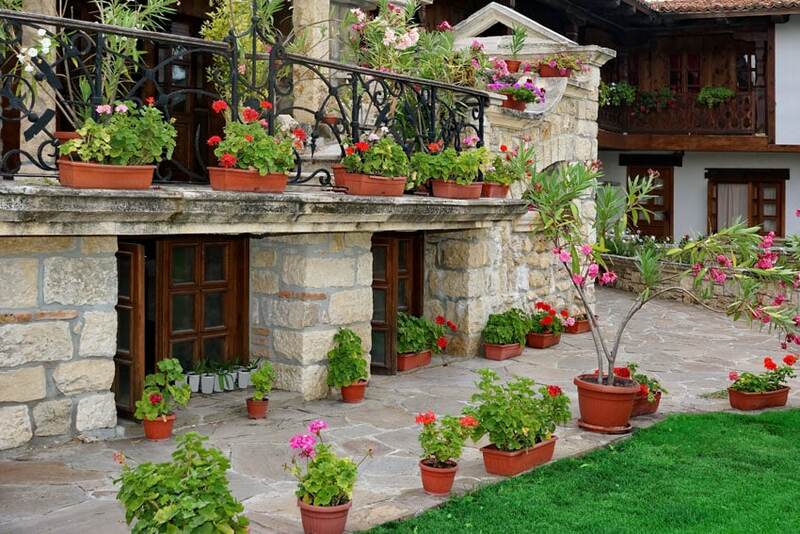 If the patio is placed against a house, it must be sloped directing away from the house for drainage. • Existing Condition of the Soil – Before setting up your flagstone patio check the condition of the soil in your yard first. For yards with “wet soil”,excavate deeper for additional drainage and better foundation. • Handling of Materials – Flagstones are heavy and may require additional assistance in terms of handling. Although building a flagstone patio can be accomplished by one person, it is always better to get a helping hand in dealing with the “back breaking” work. Always use safety items such as goggles and gloves. • Preparation. 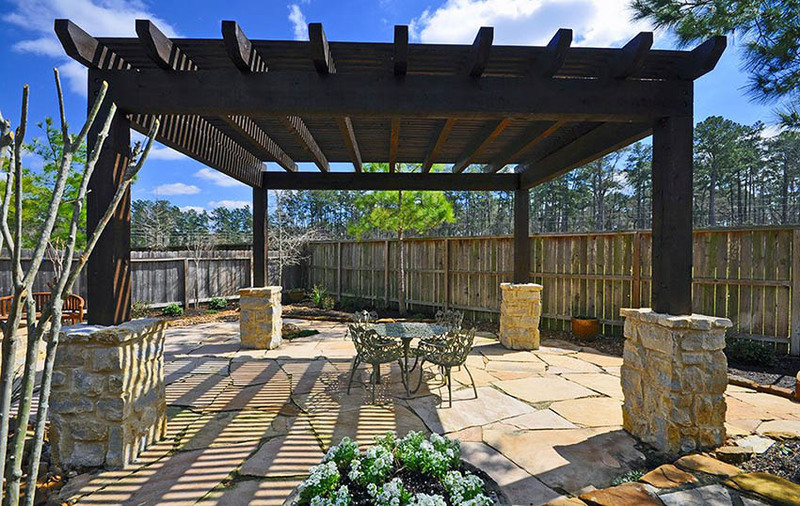 Determine the layout, shape and size of your patio. Before anything else, measure the area of your patio using a tape measure. Mark the length and width using stakes. Then tie a string in between the stakes to connect them to each other. Double check if you get the exact lay-out, remeasure for the right size then adjust if needed. • Determine the depth of excavation you will be needing. To know the depth of the pit you need to make for your patio, add 6 inches to the thickness of your flagstone (4 inches compacted base + 2 inches sand + thickness of flagstone). For example, if using pieces of stone • which are 2 inches thick, you need to dig 8 inches deep into the ground. The finished height of your flagstone patio must be leveled with the existing yard. This can be checked by using a carpenter’s level placed on a plank within the excavation. To facilitate proper drainage, an adequate depth of 8 inches is a sufficient. • Excavate the area. Using a spade, dig 8 inches deep around the perimeter of your proposed patio. Once the whole layout is complete, use a shovel to dig out all the soil according to the required depth. • Tamp down the soil. Use a garden hose to moisten the soil and then compact it firmly with a tamping tool. • Set the landscape fabric. Lay landscape fabric on top of the soil base for your flagstone patio. This will block and prevent weeds from growing later on. • Add base material. Fill the hole with 4 inches of base material such as gravel or crushed limestones. This will help prevent the flagstones from moving once they are fully set. A solid foundation must be compacted well so make sure to tamp down firmly. Also, the deeper the base, the lesser shifting is likely to occur during cold winter seasons. If you prefer to add more base material, adjust the depth of your excavation prior to this step. • Add sand. Using a rake, put a layer of 2 inches of sand of top the gravel base.Sand will help with drainage and provides an easier way to level and position the flagstone pieces. Builder’s sand or polymer sand may be used for this. However, polymer sand is much recommended because it is like mortar when wet, providing a firmer base for the pavers. In addition to that, it suppresses weed growth and won’t wash off during the rain. Tamp down sand using a tamping tool. • Lay paving materials. 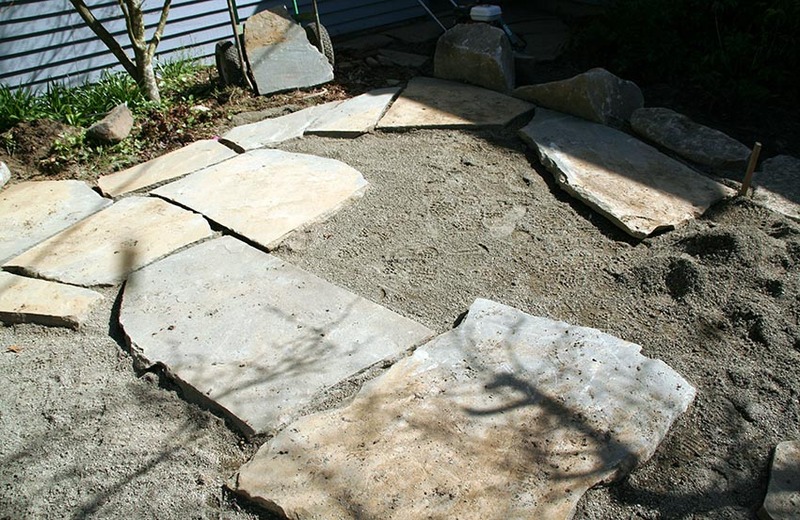 Lay down the flagstone pieces over the layer of sand. This is a tedious task because the stones need to be fit together. It’s almost like solving a puzzle so do not hurry through this step and be patient. You may either lay all the flagstones on the ground, cut them first into shapes then level them or another method is to lay the stones fit them together then cut or adjust the shapes as you go. 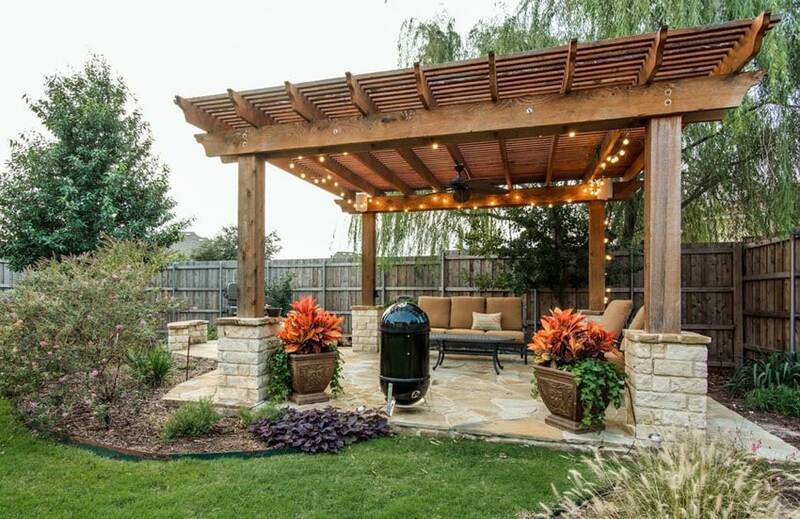 Start with the perimeter of your patio. Place larger stones outside because smaller ones have the tendency to shift after some time. Next is to set a piece of stone at the center then work your way towards the perimeter. As the flagstones are set piece by piece, tamp it down gently using a rubber mallet to secure in place. • Fill the spaces or the gaps. Fill the spaces in between the flagstones with sand or pea gravel. Sweep off excess material using a broom then soak the joints with water to settle the material onto it. 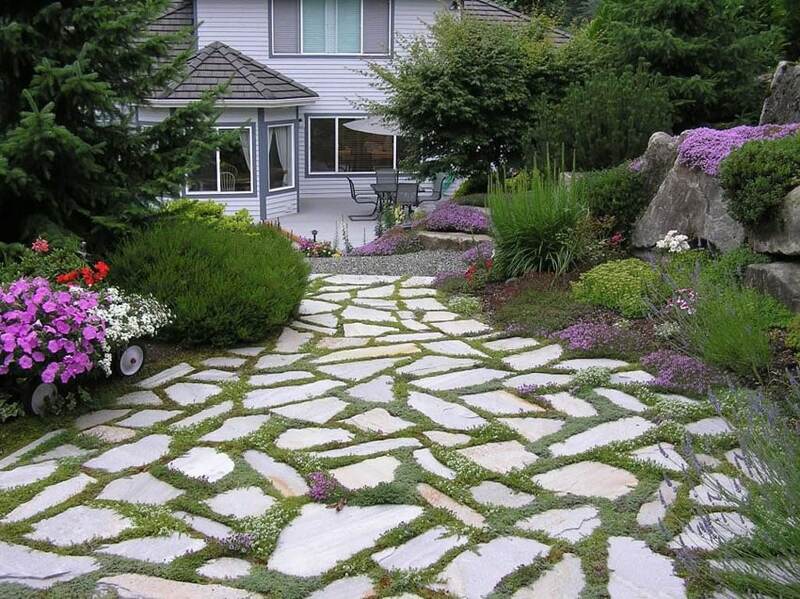 This flagstone walkway is incorporated in its surrounding landscape. If you want to add a touch of “green”, plant ground cover in between the spaces and allow the stone pieces to organically blend into your garden. 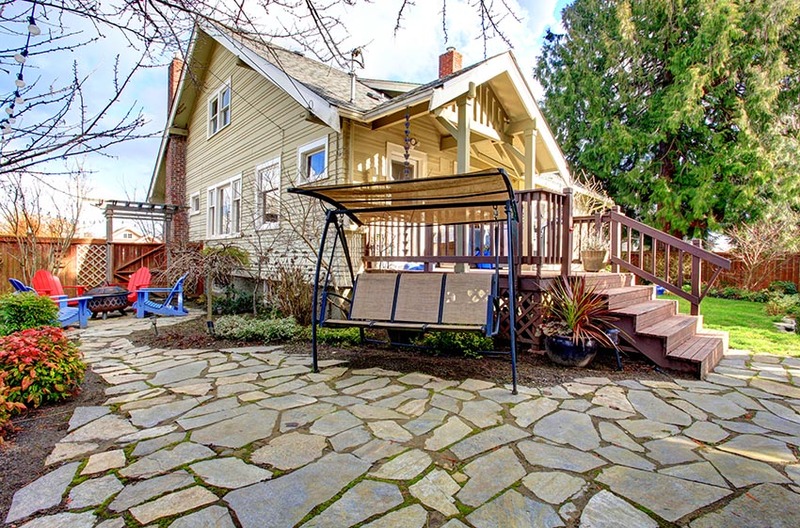 The corner of this backyard is converted into a relaxation corner perfect for enjoying a book or spending some afternoon chit-chat with a friend. 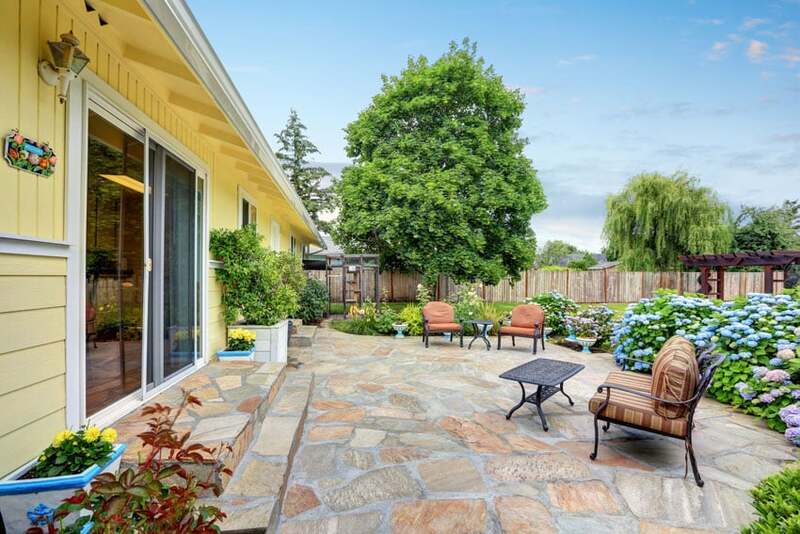 To clearly define the space, flagstones are used to separate the patio from the lawn. Flagstone patios give a dramatic flair to outdoor spaces. This outdoor living area has large irregular limestone flags which are set in a tight pattern. Its color perfectly matches the natural stone exterior of the adjacent house. Set against a bed of blooming purple flowers, this white flagstone walkway creates an interesting contrast and adds a classic charm to this garden. This raised flagstone patio with concrete block borders are perfect for displaying outdoor furniture and for adding a visual component to a house. Large pieces of irregularly shaped light colored natural stones make this small patio appear bigger. 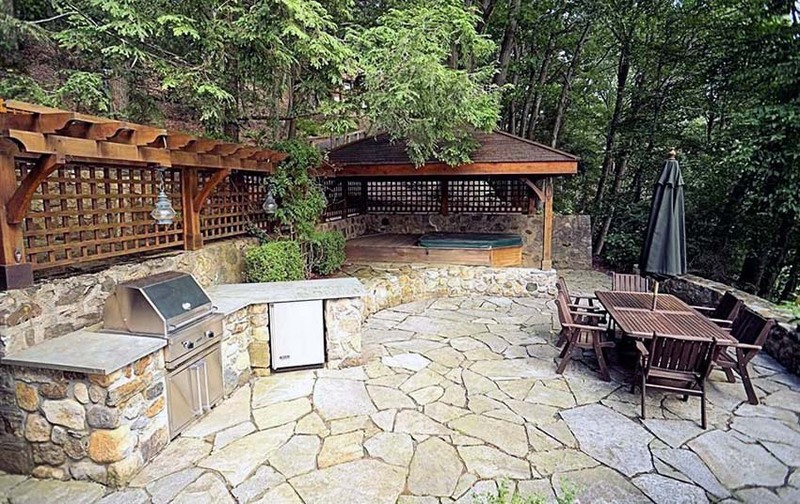 This flagstone patio pairs with the stone walls laid around its perimeter. Flagstone flooring gives drama and depth to outdoor living spaces. The contemporary vignette in this patio looks cozy and inviting as it is accentuated with irregularly shaped sandstone and a pea gravel garden. 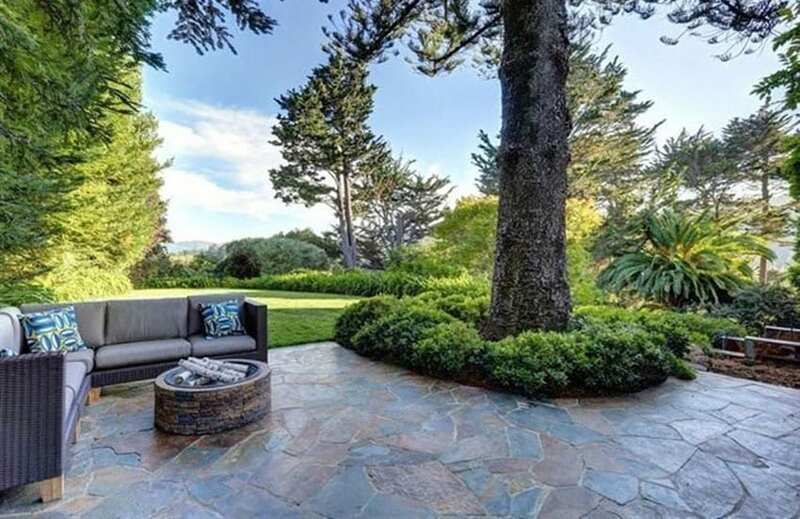 Large flat slate flagstones give life to this cozy relaxation spot which is beautifully positioned at the front yard of this country inspired home. Bright colored outdoor chairs and a matching swinging chair contribute to the welcoming feel of this space. Flagstone patios instantly create variation in texture and color giving more depth and dimension to a space. The travertine flooring on this flagstone patio add subtlety to the overall muted color scheme of this space. Metal outdoor furniture with light teal cushions marry perfectly with the color of beige natural stones, while tangerine printed accent pillows add life and a splash of color. This large patio has a sandstone flooring which pairs with the natural accent stones set at the bottom of the pergola posts. The rough texture of the flagstone patio is the main design element which completes the rustic charm of this inviting entertainment area. The picture above shows a modern take on a flagstone patio, wherein stone pieces are set at a closer and tighter pattern. To create a stunning visual impact, outdoor floor tiles are mixed with irregularly cut natural stones. 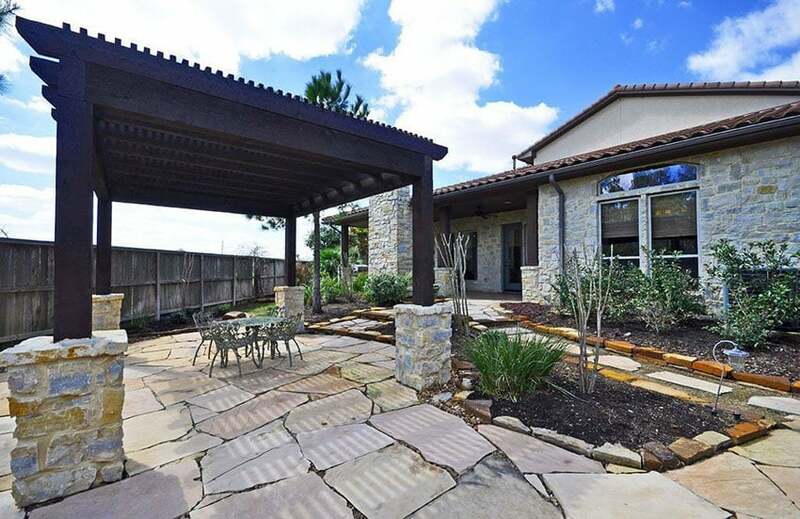 This Contemporary covered raised flagstone patio made use of irregularly shaped limestone “flags”, a redwood pergola and wrought iron furniture. 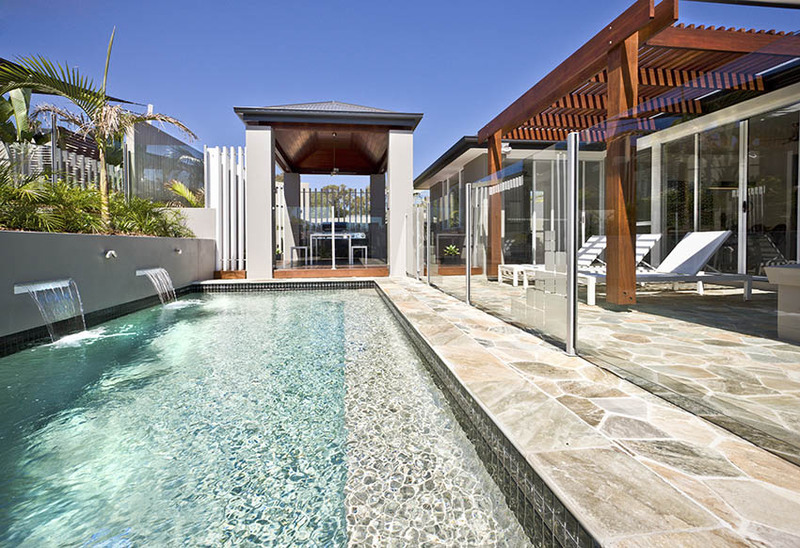 This contemporary flagstone patio is interestingly set in a pool area with natural rough stone borders. In here we can see how the change in flooring material can delineate spaces. Coarse large irregularly shaped quartzite flagstones bend well with the built-in cobblestone outdoor kitchen in this patio. Cedar lattice fence screens, a wooden dining set and a decking with a hot tub all make this space warm, homey and cozy. 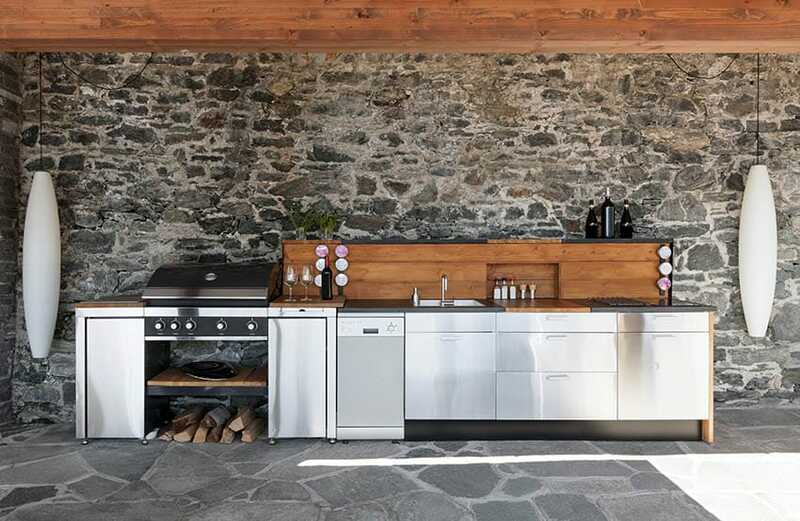 This modern outdoor kitchen is accentuated with a coarse stone wall and mosaic patterned basalt flagstones. The sleek streamlined look of stainless steel kitchen cabinets and accessories create a stark contrast with the accent stones, proving that modern and traditional elements can be fused together. This flagstone patio features a matching natural stone grill pit, an L shaped outdoor sofa and rich toned natural stone pavers. Set in a countryside landscape with a stunning view, this cozy corner will surely turn your afternoons into a relaxing retreat. 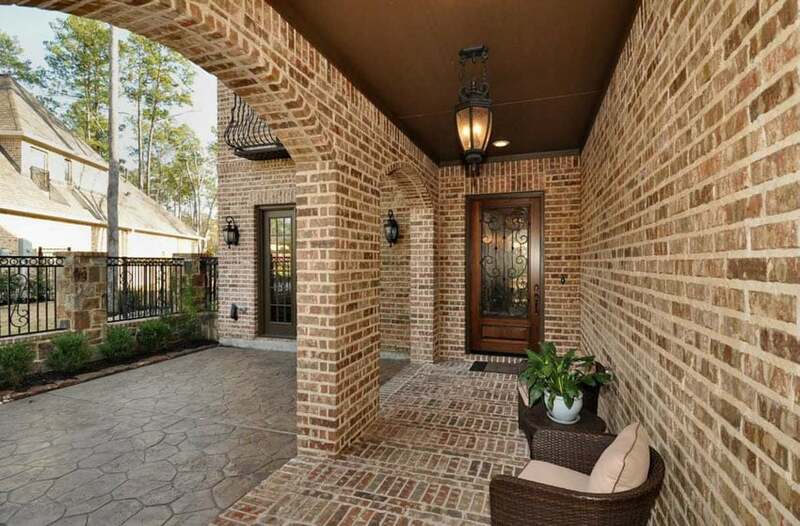 A mixture of traditional old world inspiration and classic Mediterranean style, this outdoor patio features a tan colored brick wall with natural stone paver flooring. The flagstones subtly breaks he continuity of the strong exterior finish by creating a change in texture and color. 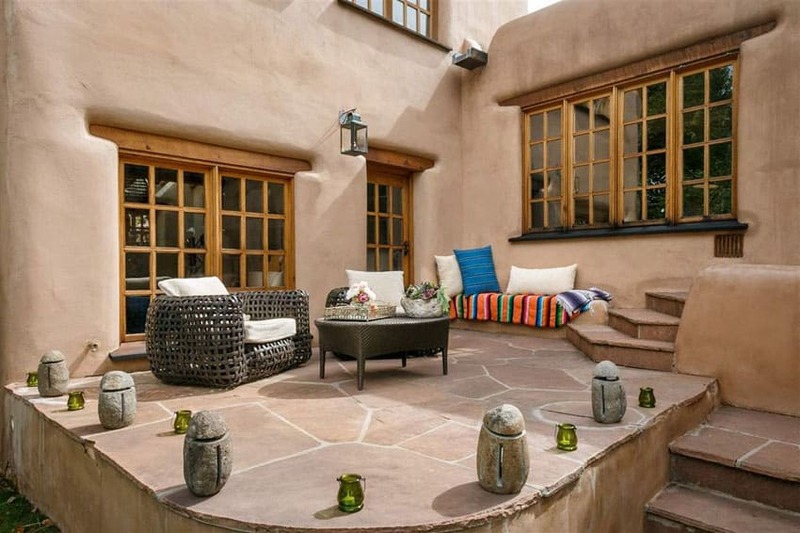 This Spanish style patio features large flagstone flooring which perfectly matches the exterior stucco finish of the house. Statement furniture pieces and bright accent pillows are added for a modern vibe. Heavily dramatic, rich and striking, this flagstone patio design features warm toned natural stone flooring, a brick accent border and weathered wooden furniture. The overall look of this patio harmonizes with the rustic exterior of the house it is adjacent to. Concrete is a good alternative for simulating the look of natural stone materials. This modern minimalist patio features a mixture of accent stones for the plants borders, a brick wall and concrete pavers. To match the clean lines of this patio, well groomed or shaped foliage is incorporated into the design. Concrete may also be molded into different texture and finishes to make it more natural looking. This concrete patio has large irregular pieces which are highly textured – bearing resemblance to natural basalt flagstones. Other ways of achieving the “flagstone look” using alternative materials is by stamping concrete or using ready made paving tiles. This decorative concrete block is a perfect fit to the size and shape of the patio. Pea sized gravel is added to the sides as borders. This rustic flagstone patio is accentuated with large coarse natural stones which extend from the borders, to the steps and the walkway. 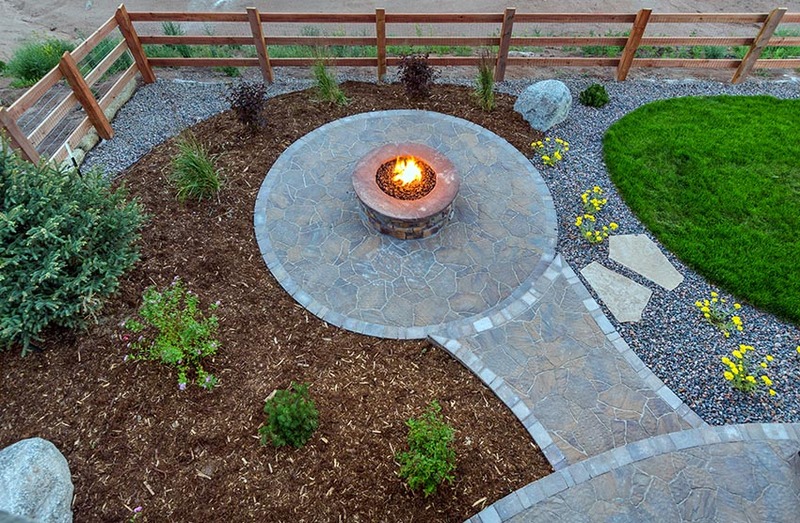 The addition of a fire pit in your flagstone patio will enable you to enjoy specific activities anytime , whether to enjoy a nice grill out in the backyard with friends or to catch warmth during a cold night. A fire pit is actually pretty easy to install. It is comprised mainly of stones which are interlocked together to form a circular shape. These layers of stones are usually 3 to 4 full courses high and are joined by mortar. Outdoor fire pits are usually built-in or incorporated within the patio design, making it a functional central feature. 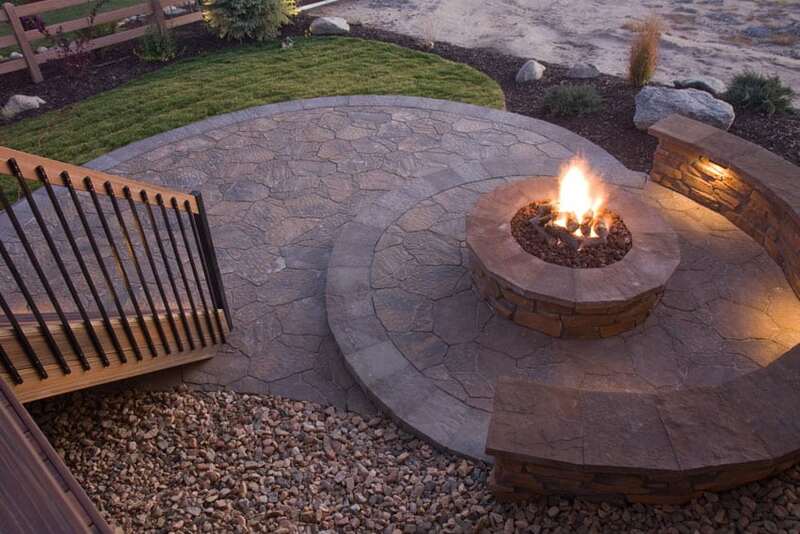 In terms of design, walls for a fire pit are usually matched with the paver flooring for patios to create fluidity. 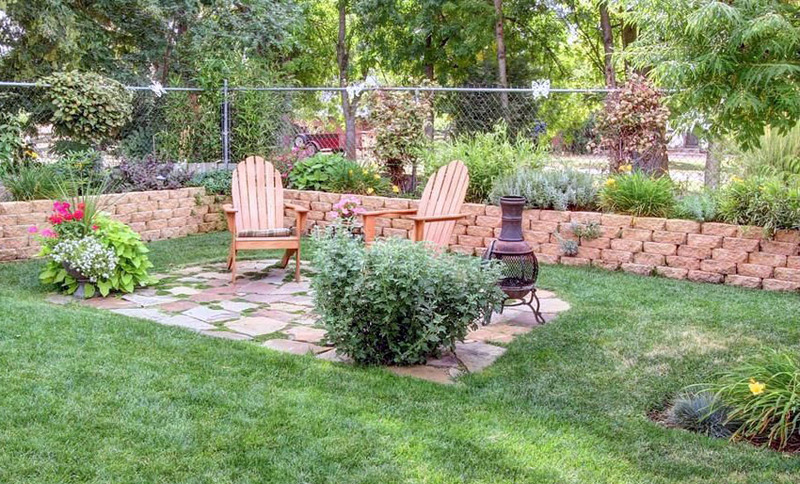 A relaxing DIY stone firepit is featured at the center of this quartzite flagstone patio, surrounded by wooden lounge chairs, a rustic garden and a verdant lawn. 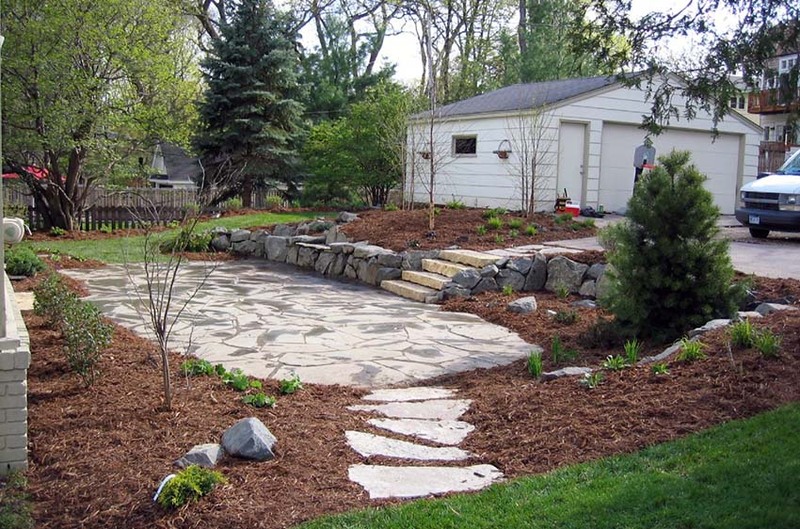 This round flagstone patio extends to the walkway and is encompassed with bark, pea gravel and grass. From a full view, we can see how space is clearly defined through changes in flooring material. Aside from that, the variation in texture and color also adds a creative play of design elements. This rustic flagstone patio has a natural stone fire pit with wrought iron benches and a shabby wooden double rail fence. 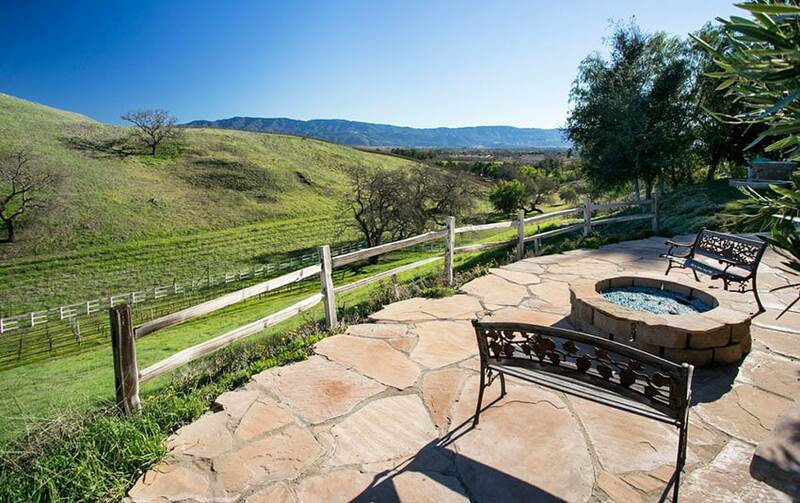 This patio design blends well with the breathtaking view as both exudes with a countryside charm. 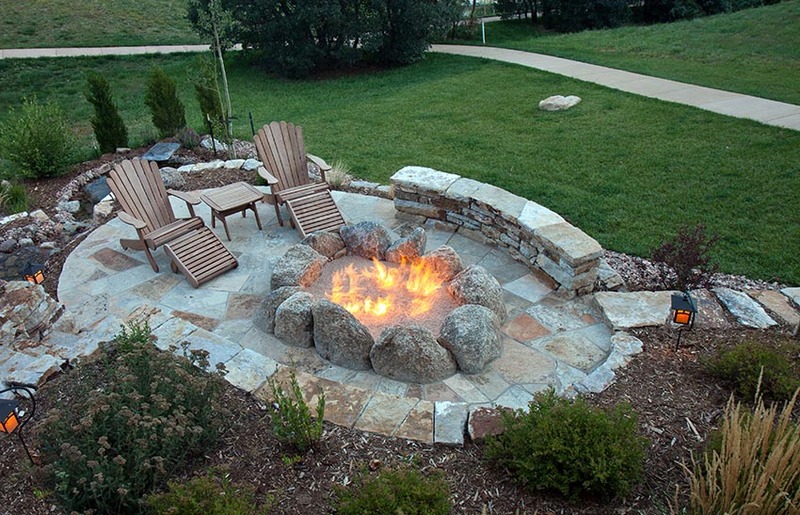 This flagstone patio features a matching stone fire pit with circular bench seating. 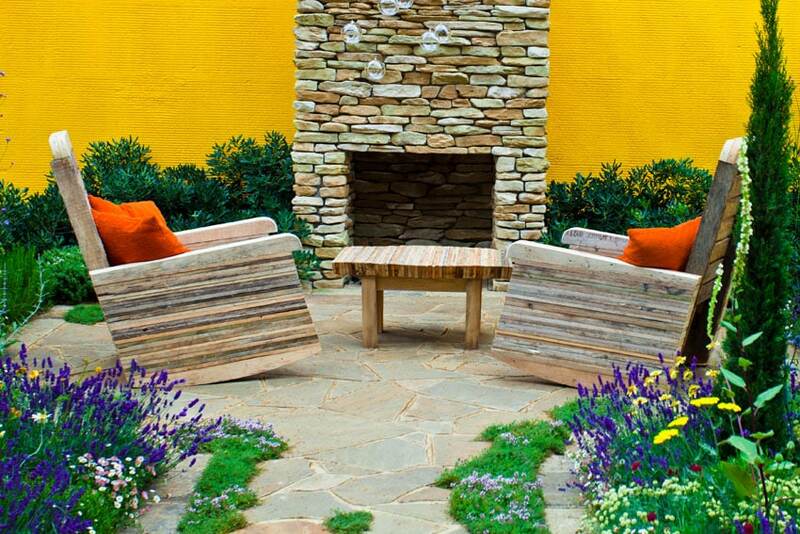 We can see how this outdoor relaxation spot stands out in this space. 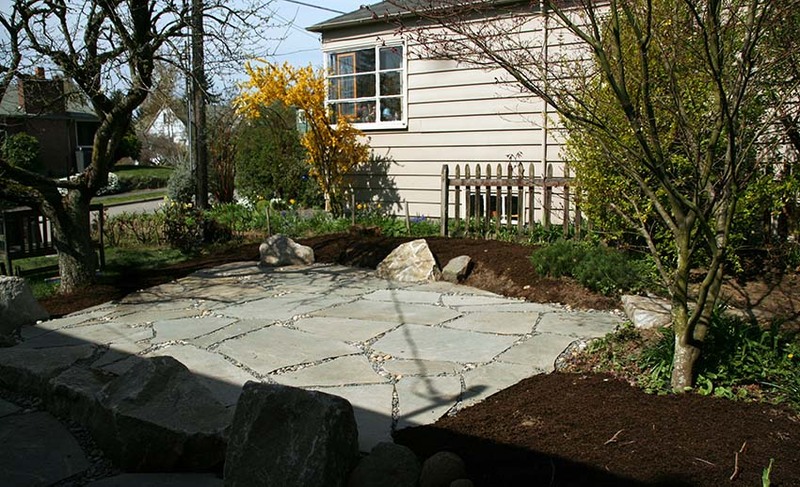 This rustic flagstone patio has large irregular gray and tan colored natural stones with pea gravel fillers. 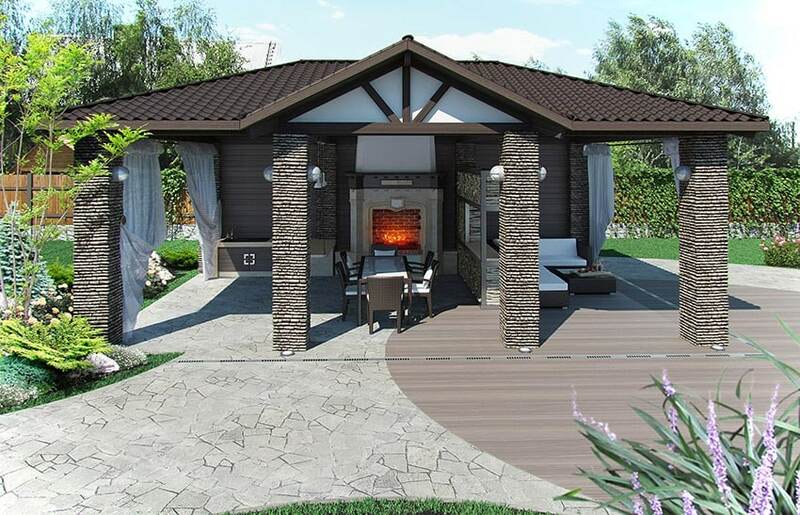 It also features a portable fire pit, which is an ideal option for homeowners who do not want to incorporate a built-in version at the center of their patios. 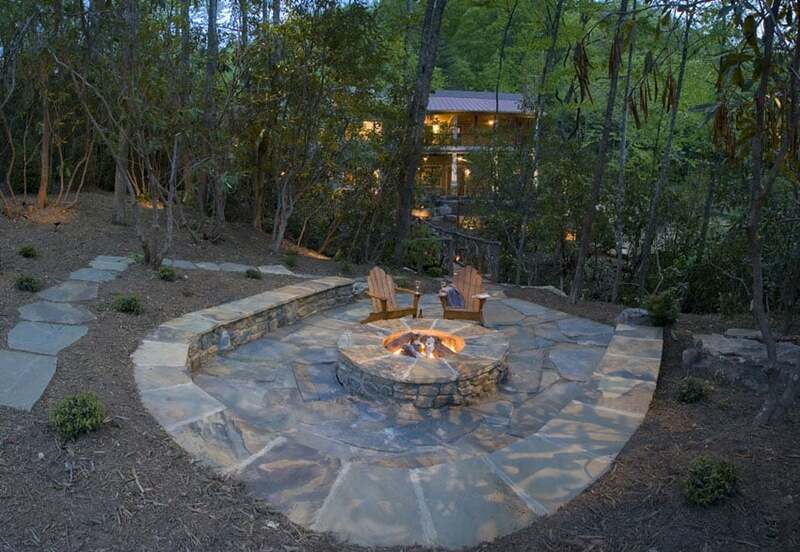 This concrete and natural flagstone patio has a built-in fire pit with a curved bench – a perfect spot to end a long day of work and a relaxing retreat to spend cold nights with friends and family. Flagstones are a stunning addition to any type of outdoor space , whether it may be small or big. If dealing with small patios, choose flagstones which are larger in size and keep spacing tighter as it tends to create an illusion of continuous flooring. Also, select lighter colors for the flagstone to make the space appear bigger. 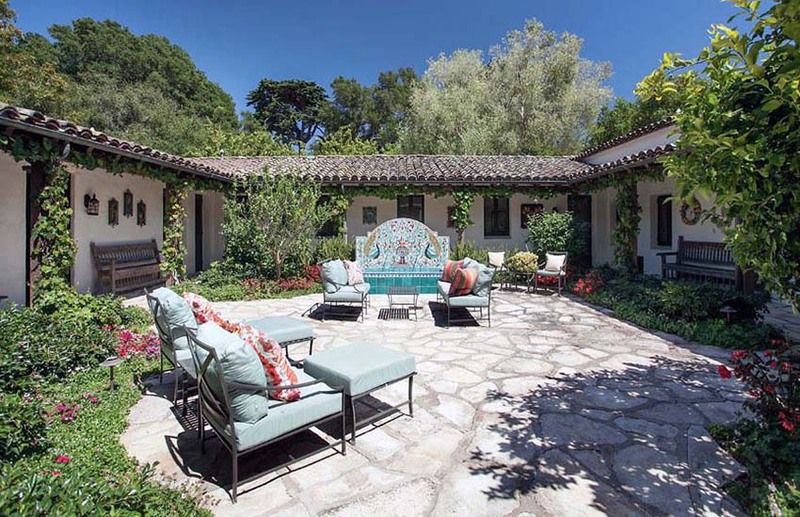 This charming old world style villa features a natural beige limestone flagstone patio and limestone exteriors. Blushing blooms of flowers are added to soften the look and tone done the architectural components in this space. This flagstone patio design features natural stone pavers, a stacked stone fireplace and rustic wooden rocking chairs with a matching table. Beautifully tucked at the corner of this flourishing garden, this space exudes in charm and rustic flair. 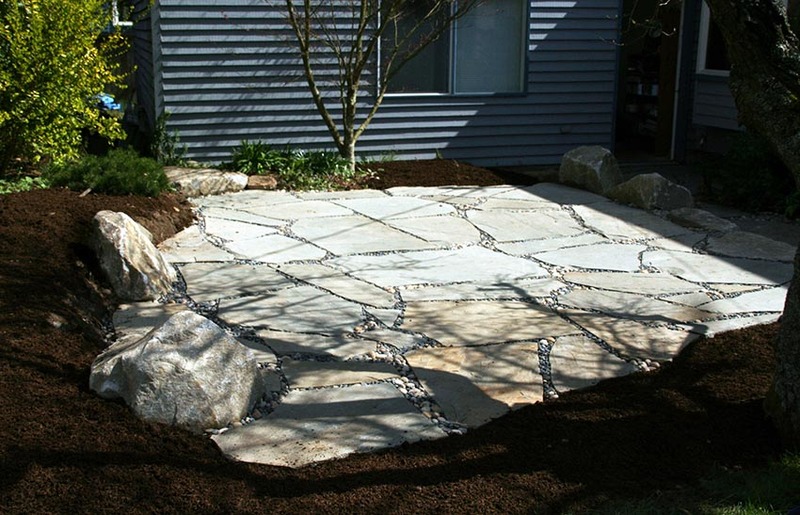 This “Do it Yourself” flagstone patio features sandstone pavers and a natural rock border. The light color of the materials are a perfect match for the navy blue sidings of the house.